Candied grapefruit peels are a delightful and special treat. They take a while to make, but most of that is inactive time. Nibble on them as is, or see the end of the recipe for suggestions on other ways to enjoy candied grapefruit peels (hint: chocolate and citrus are always good companions). Once candied, grapefruit peels will keep for months. 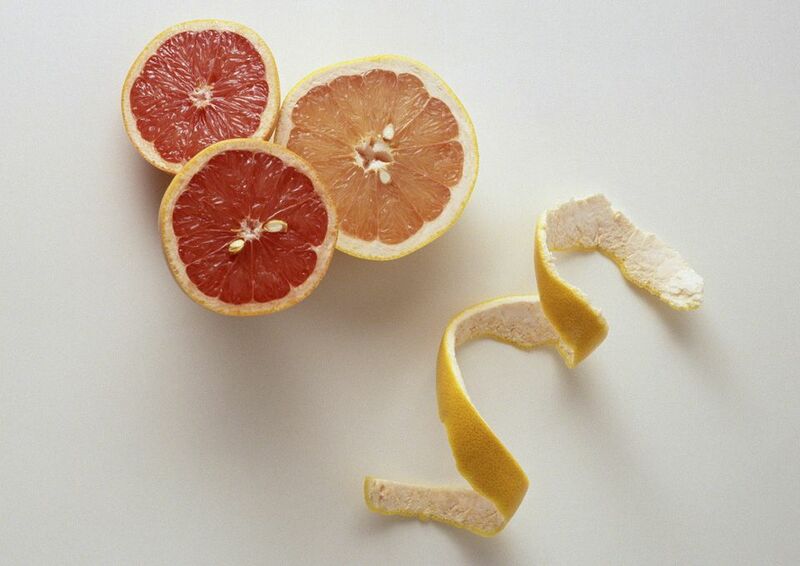 Slice your grapefruit peels into any shape you like, but since the most common way to eat fresh grapefruits is to cut them in half, this recipe starts out with grapefruit halves. Collect the peels in plastic or glass containers in the refrigerator until you have enough to proceed with the recipe. After you've eaten the grapefruit, scrape the leftover membranes away from the white pith and peel using a serrated grapefruit spoon or any small metal spoon. Compost or discard the membranes. Note: the thicker the layer of white spongy pith the peels have, the better for candied grapefruit peels. Slice the peels into 1/2-inch wide strips. Put the grapefruit peel strips into a large nonreactive (no non-enameled aluminum, cast iron, or copper) pot. Add water to cover the peels by approximately 1 inch (the peels will float - press them down lightly with a spoon to guesstimate the water level). Bring to a boil over high heat. Turn off the heat and immediately drain the peels in a colander. Return the drained peels to the pot and again cover with water and bring to a boil. Drain the peels again. Repeat this process two more times (four times total). In addition to softening the peels, the changes of water during this cooking process remove some of the bitterness from the white part of the peels. After the fourth time you have boiled and drained the peels, return them once more to the pot. Add 2 1/2 cups of the sugar along with enough water to again cover them by 1 inch. Bring to a simmer over medium-high heat (do not boil), stirring to dissolve the sugar. Reduce the heat to low. Simmer for 2 hours. After 2 hours of cooking in the sugar syrup, the peels will be very soft and the white pith will have become translucent. Let the peels cool completely in the syrup. You can store them in the syrup in the refrigerator for up to 3 weeks, or proceed to the next step below. Lift the peels out of the syrup with a slotted spoon and transfer them to a rack over a baking sheet. The leftover syrup is very tasty and can be reserved for another use. Let the peels drain and start to dry out a little for 4 hours or overnight. The baking sheet is to catch the dripping syrup. Put the remaining 1 cup of granulated sugar on a plate. Roll the candied grapefruit peels in the sugar, coating them completely but shaking off any excess. Store the candied peels in airtight containers at room temperature for up to 3 months. They are still safe to eat after that, but the quality declines. Enjoy the candied grapefruit peels on their own as a treat, or you can also chop them up and add them to dessert recipes. Grapefruit sorbet with candied grapefruit peel bits is a sophisticated and delicious way to use the candied peels. Another option is to give the candied grapefruit peels a chocolate coating. To do this, skip the step of rolling the candied, drained peels in sugar. Instead, once they have drained and dried on the rack, dip them in melted chocolate. Let the chocolate coating cool and harden before storing the chocolate-coated candied grapefruit in airtight containers.